A man has been left with serious head injuries after being assaulted in Clydebank. 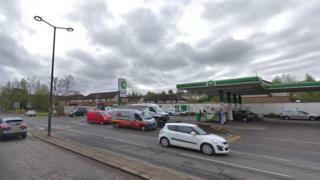 The 25-year-old was injured outside the BP petrol station in the town's Glasgow Road at 02.45am. He was taken by ambulance to the Queen Elizabeth University Hospital in Glasgow where he is being treated for his injuries. Police want to trace four men who were seen speaking to the injured man prior to the assault. They are described as being in their early to mid-20s. Det Sgt David Meikle said: "At this early stage we are gathering as much information as we can to establish the circumstances surrounding this incident. "Officers have been carrying out inquiries in the area and gathering CCTV footage to gain further details. "This is a busy road and I would urge any witnesses who have not yet spoken to police to come forward."